Abstract: Each fin is interconnected with one another by means of small copper tabs. Thus the sum of these many small parts is very sturdy. 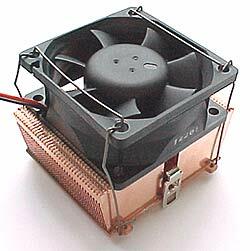 Be sure to "Listen to this Heatsink!" Of all the copper heatsinks that have come across our desk to review, the Thermalright SK6 has got to be one of the most intricately made. Unlike many of the copper heatsinks available to the performance user, the SK6 uses angled sides and a very unique means of attaching different sized fans. As the unit we tested came without a fan, we decided to test out the SK6 on the biggest, badest, and arguably loudest fan we had - the 60mm Delta! Never one to sit on our laurels, we are now offering Frosty Acoustic Samples along with our heatsink reviews. Be sure to click on the headphones icon and "Listen to this Heatsink" in action! In total there are 36 sets of 0.5mm thick copper fins that are soldered, not glued to the 5.5mm thick copper base. Each fin is interconnected with one another by means of small copper tabs. Thus the sum of these many small parts is one very sturdy thin-fin copper heatsink. It hummed, it purred, and it cooled like a daemon... so let the fun begin! AMD Athlon, Duron, K6-2. Intel FC-PGA, PGA. VIA Cyrix III.